The Acer EI491CR is the brand’s next high-end monitor representative to the fast-growing and highly competitive 49-inch segment which caters to both gamers and professionals. This model sports similar specifications to the pioneering Samsung C49HG90 which targeted dual display setups with its panoramic 32:9 screen. The Acer EI491CR is late to the party since we’ve seen higher resolution options coming to or already in the market, but let’s see what the Predator branding can bring to the table. The Acer EI491CR sports a sleek and clean matte black design with the red accents found on older Predator monitors muted to a certain degree. The product looks like most office displays due to this, although the massive 49-inch diagonal gives the higher purpose of the device away. The face isn’t bezel-free due to a thin plastic layer and the usual VA panel borders which shouldn’t be too noticeable even when its in use. The rear cover of the Acer EI491CR’s chassis is smooth and finished and matte black save for the air vents at the top and the 7-color ambient LED ring at the stand’s connection point. There is no mention of RGB ecosystem compatibility, but the limited color options for the latter which also doubles as a bias light already betrays that fact. The Acer EI491CR’s chassis curves at a radius of 1800r which means it will be tighter than most ultrawides available on the market. Distortion worries will be present, but the form factor is great for engrossing effects or immersion when gaming. The problem with massive screens like this is that the corners sometimes fall out of your peripheral vision’s range, but that won’t be the case due to this characteristic. The Acer EI491CR doesn’t sport a joystick for OSD manipulation, but we’re glad the brand decided to implement a design similar to what LG is doing now. The buttons are located on a protruding nub at the center of the bottom chassis for easy access. It won’t be as user-friendly as a JOG button, but at least you don’t have to extend your reach to the far corners of this display. The biggest physical downside of the Acer EI491CR is its tilt-only stand which could have at least offered height adjustments. The Y-shaped base looks like it will consume a lot of space, so make sure you have a wide and deep desk before buying this model. You can replace this part with a monitor arm that supports 30 lbs, but you are going to need one with a 75 x 75 mounting pattern. The connectivity layout on the Acer EI491CR is simplified as well since there are no extras such as USB slots. You will find a DisplayPort 1.2 connector as the primary along with a port each for HDMI 1.4 and 2.0. There is also a pair of 3-watt speakers, but we’re already guessing that the sound quality will steer users into opting for headsets or separate sets. The Acer EI491CR boasts a 49-inch VA panel with a 3840 x 1080 DFHD resolution, a 144Hz maximum refresh rate, and 4ms response time. The listed native resolution sits at 120Hz, meaning this model is overclocked to achieve 144Hz and the boost it provides. The contrast ratio goes up to 3000:1 while the panel is supported with a 400 cd/m2 backlight. Monitors like this are great for immersive gaming, but we know many users doubt how the lower PPI looks in practice. While higher resolution QHD models look better and sharper in this size, we don’t think the DFHD screen looks bad in games. It’s almost identical to two 20+ inch monitors in clarity, but the best news is you don’t have to deal with bezels at the middle. The Acer EI491CR’s VA panel provides an 8-bit color depth with Quantum Dot coating which enables it to produce as much as 90% DCI-P3 on paper. We advise taking that specification with a grain of salt since not all monitors tagged with it have fully reproduced the extended gamut when checked with a colorimeter. The monitor is also listed as VESA DisplayHDR 400 certified, but the requirements of that standard aren’t rigorous enough to create readily noticeable improvements in lighting and dynamic range. DisplayHDR 400 specifications are too loose to be meaningful enough for gaming or movie visuals. We’re sure the VA panel combined with Quantum Dot tech will produce very vibrant colors, but the limited 400 cd/m2 backlight will do little to maximize that. One of the main selling points of the Acer EI491CR is its FreeSync 2 compatibility which is associated with HDR monitors. The implementation doesn’t require a very expensive FPGA unit like G-Sync HDR does, costing as much as $500 on top of the premium monitor’s selling price. We’re always excited to test FreeSync 2 monitors, but most of the variants sold with the add-on have DisplayHDR 400 standards which can be a little underwhelming. The VRR tech’s variable range is yet to be revealed, but we’re also hoping for G-Sync compatibility with minimal to no issues. 3840 x 1080 at 144Hz is relatively easier to run as far as 49-inch monitors go, but its best to have GPU options from both brands to use this beast at its maximum potential. The Acer EI491CR is something to look forward to because it’s a 144Hz 49er that will launch at a very low price compared to the Samsung C49HG90 which started at over a grand. We’re glad that the monitor market is slowly growing past its current standards while prices keep dropping. 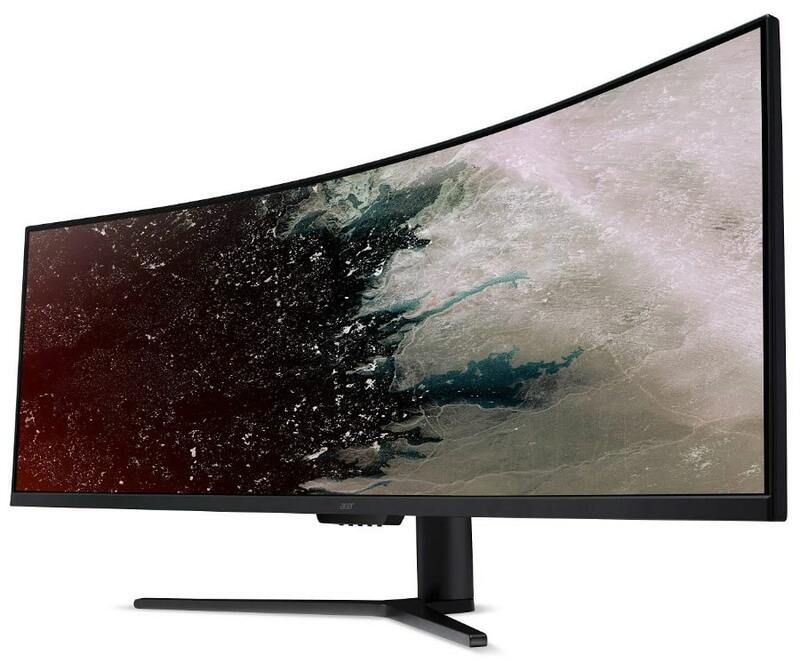 The monitor’s capabilities are perfect for all types of gamers, so its fantastic that more households will find it easier to own something as big as this model. The Acer EI491CR is starting to become available for pre-order on select retailers in the United States, with the UK and EU countries getting their stocks by May of this year. The first US residents to order receive their units by the 15th of this month or the following days after that. The original SRP listed for this model sits at $899.99, but that will come down to a more affordable range once supply stabilizes.